The college football season is nearing the end of the season, and it’s almost time for the selection of the Heisman Trophy award for 2010. Another quarterback has been mentioned as the prospective winner for this year. Quarterbacks have won 8 of the last 10 Heisman Trophies (That’s including 2005, the Reggie Bush year). Heisman winning Quarterbacks, however, have not necessarily made the adjustment to the NFL very well. Take a look at the chart below to see how the last 15 Heisman winning Quarterbacks over the past 27 years have fared in the NFL. As you can see, only three of these quarterbacks started enough games to cover more than 4 seasons, and they are Doug Flutie, Vinny Testaverde, and Carson Palmer. Although 4 others lasted more than 5 years in the NFL, they were basically career backup quarterbacks and never got into the games. Two Heisman winners were never even drafted into the NFL, and a third was drafted as a receiver and lasted only one year. The jury is still out for Matt Leinart, Troy Smith, and Tim Tebow, but none of these three right now look like they will be starters in the NFL. Sam Bradford, in his rookie season, is starting for the St. Louis Rams and seems to be doing good enough to keep that job. The only other quarterback who has started every game they have played in is Carson Palmer. Vinny Testaverde was basically a starter in the NFL for about 15 years, and has probably been the most successful quarterback to win the Heisman over the past 30 years. Doug Flutie, after taking a detour in the United States Football League (USFL) in his rookie season, and 8 years in the prime of his life in the Canadian Football League (CFL), had an successful NFL career. He currently has the second highest quarterback rating out of all the Heisman winning quarterbacks over the last 30 years. Only 3 out of the last 15 quarterbacks (20%) who won the Heisman in the past 30 years were able to make the transition into a successful career in the NFL. 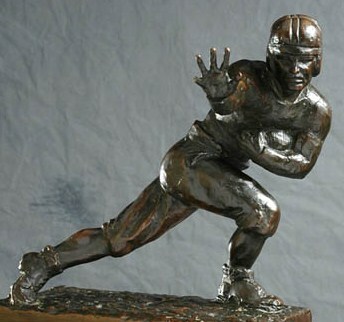 Two out of the three successes were the two oldest Heisman winners, who won back in 1984 and 1986 respectively. Essentially, there has been only one successful starting quarterback in the NFL within the last 23 years who also won the Heisman. There are 3 Heisman winning quarterbacks out of the last 15 (20%) who never played a down in the NFL. The success rate is not very high when it comes to Heisman winning quarterbacks making the transition to a successful NFL career, as history has proven.